Hi to all of The 36th AVENUE’s friends! I’m so happy to be here with you all today to share this amazing recipe! that is just beautiful and LOOKS like you slaved all day!! BUT… this Mixed-Berry Crostatais SO simple to make!! It uses a premade pie crust AND whips together in 25 minutes flat (baking time included)!! Using a cookie sheet lined with a piece of parchment paper, unroll pie crust in the center. Spread preserves in the center of pie crust leaving a 1 1/2 inch clean around the outer edge. Evenly sprinkle berries over preserves. Fold the outer edge of pie crust in and crimp, leaving the center open, to make the decorative edge. Brush decorative edge with egg white. Bake for 20 minutes or until crust is nicely browned. Serve warm or cold, Enjoy! 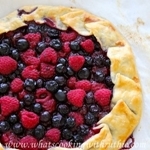 Mixed-Berry Crostata is a fabulously easy dessert recipe that’s simply mouth-watering!! You’re guests will be totally impressed!! It’s wonderful served warm with ice cream for a perfect ending to any dinner! Thanks SO much to Desiree for having me be a contributor once a month on the 36th AVENUE!! I love Ruthie and I would love to visit her kitchen and have a cooking date with her. Browned Butter Banana Bread Brownies have my name on it. Make sure to visit Ruthie’s blog Whats Cooking with Ruthie.com for many other delicious recipes. I am honored to have her as contributor here at The 36th AVENUE. PreviousPaint and make your own ceramic candy stands.